Happy Superbowl #SundaySupper! I am so excited for today's lineup hosted by one of my favorite food bloggers, Jen at Juantias Cocina. Nothing makes me happier than a good tailgate with amazing food. I had a very hard time deciding on one dish to make. After changing my mind 100 times, I decided to make Cheesy Jalapeno Peach Hush Puppies for Super Bowl. Since the Super Bowl is in NOLA and we are going there in 3 weeks, I felt I had to honor the city with some good southern food. I found this recipe on the Chobani Kitchen website and couldn't wait to make them! This is a lightened up recipe, using peach flavored Greek Yogurt. After a little speculation and a few burns on my fingers, I could not have been happier with the result. I did not tell my boyfriend that I used Greek Yogurt in this recipe and he raved on and on about how good the hush puppies were. They are super easy to make and I had all of the ingredients in my kitchen, yay! 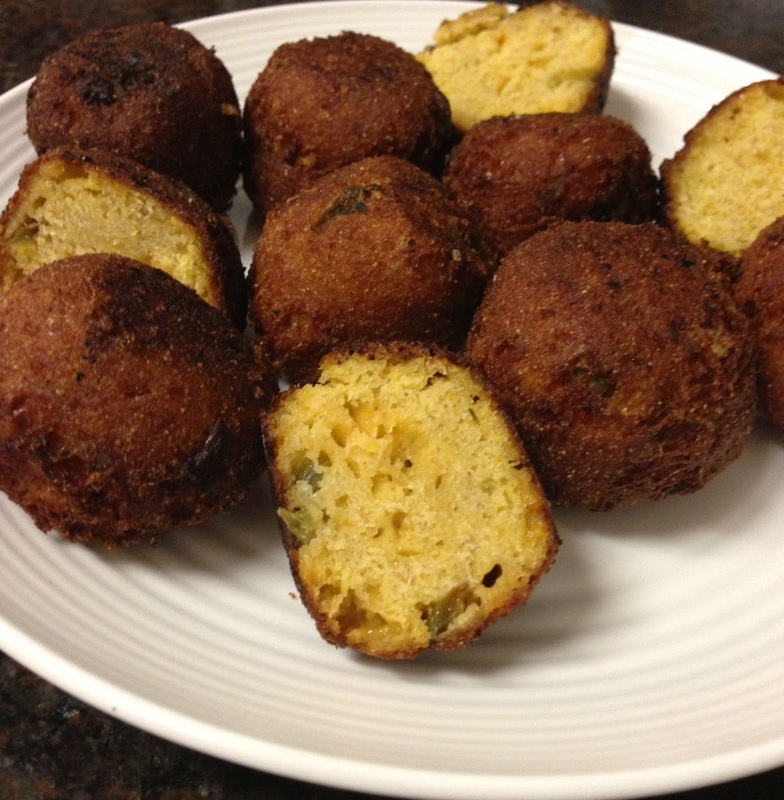 These hush puppies would be amazing with your next fish fry or BBQ as well. Step 1 Mix cornmeal, flour, sugar, baking powder, baking soda and salt. Set aside. Step 2 In a large bowl combine Chobani and water, then add dry mixture, jalapeños and cheese and stir. Step 3 Form nuggets. Fry in 3” of 365°F oil until golden. Serve hot. Now, check out these other amazing recipes that you will want to bookmark for parties throughout the year. I cannot wait! Join the #SundaySupper conversation on Twitter today to talk all about our Super Bowl Recipes! We’ll tweet throughout the day and share recipes from all over the world. Our weekly chat starts at 7:00 pm ET and you do not want to miss out on the fun. Follow the#SundaySupper hashtag, and remember to include it in your tweets to join in the chat. Check out our #SundaySupper Pinterest board for more fabulous recipes and food photos! Ohhh Hush puppies make me miss the South! What a fun flavor combo. Yum! When my peach trees bloom, I am SO in! YUM! 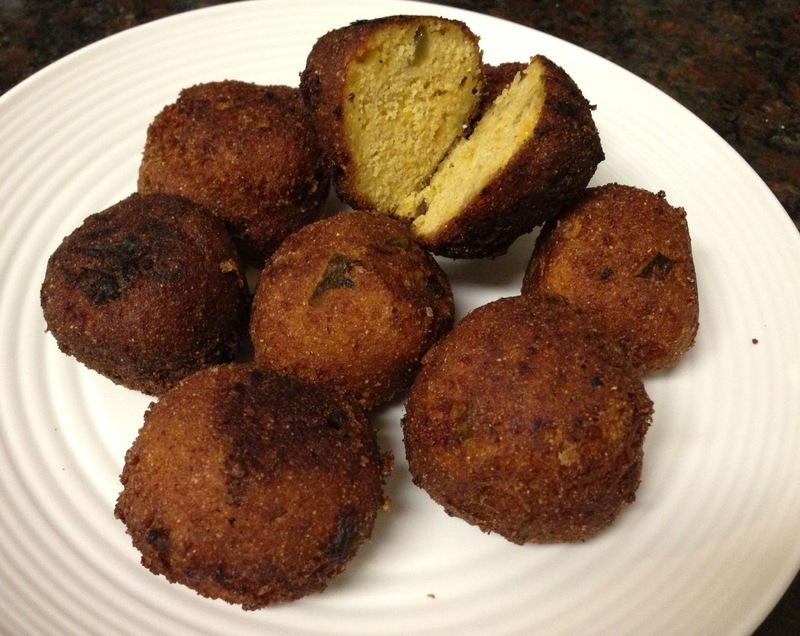 I love Hush Puppies and I love the idea of peach and jalapeno together, so perfect!!!!! YUMMO! I am seriously craving a few of these right now...looks like they turned out fabulous! I love how Chobani Greek Yogurt adds such nice moistness to many recipes, and I especially like the yin and yang of sweet and savory you have going on in your #SundaySupper Game day Hush Puppies! I can pass on regular plain hush puppies. These are totally different and full of flavor! I would run to a basket of them. Peach and jalapeno, wow that would be so good!! Great twist on hush puppies! they are one of my favorites! What a fantastic idea! Love that they are lightened up and love that you didn't tell your man that LOL!!! Teehee I do the same thing! I love hush puppies. This is a wickedly cool combo. Peach in hush puppies sound like such a great combination. What a perfect flavor combo to kick up a great appetizer! Yummy! These sound like the perfect combo of sweet and heat. I love hush puppies, but these sound a million times better than just regular ones. The last time I had hush puppies they were so dry--these look so moist and yummy, and the flavor combo sounds great! Wonderful idea! The Jalapeno and peach flavors seem like a great combination. Kudos! Spicy and cheesy hushpuppies sound peachy to me :) They look PERFECT!!! You've made hush puppies user-friendly, healthy AND delicious! Oh wowww! I actually made a lightened up version of mac n cheese using Chobani that I plan to post later this week :) These look amazing and thank you for all the links! YUM!!!!! Love the contrast of sweet, spicy and cheesy! WANT! These look delish! Never had regular hush puppy but these look better! ooh, who'd have thought you could use peach yogurt in these babies ! yummm ! I have never made homemade hushpuppies but I think I am going to start with this recipe. I love the combination of flavours you have in these.